Loyal Competition – The oligarchic system of the republic created an aristocracy of wealth, whose prosperity depended on the security of its property, as protected by Roman law. This limited the extent of treason within Rome. Internally bred rebellion against Rome seems to have mostly been pursued as a struggle for internal power. Thus, asides from (the perhaps fictitious) Coriolanus, I cannot think of other parallels to the treasons of Pausanias, Themistocles and Alcibiades in ancient Greece. Clearly, power was worth fighting for, but success was within the Roman legal-political structure, not outside of it. Adaptability of Legal Franchise – Roman citizenship was a layered affair, both for those who possessed it and for those hoping to claim it. Initially, the security of the law seems to not have extended very far. Indeed prior to the 12 tables, it seems to have been mostly exercised as a right of might, the abuses of which could be considered to have been the cause of those tables and the Lex Licinia Sextia (376BCE), Lex Ogulnia (300BCE), Lex Hortensia (287BCE) and Lex Aquilia (286BCE) that emerged during the conflict of the orders. Thus by the threat of secession at times of crisis the non-privileged plebeians were able to gain a semblance of legal and political equality of opportunities, in principle. Roman citizenship grew into a large body of law, mostly concerned with specific rights (to vote, to run for office, to property, to trade, to appeal court decisions to higher instances, etc). These could then be incorporated and mixed into different clusters or classes of citizenship which could then be extended to others. It is important to not exaggerate the importance of this tool, but clearly Roman citizenship, because it was layered, was more easy to share in part than say Athenian or Spartan citizenship, which had to be conceded in absolute. In most cases citizenship was based on jus sanguinis, although Rome had spread it abundantly. This can be attested by the Latin right (338 BCE), the aforementioned extension of Roman citizenship to Etruria and Piceneum as part of Marius’ reform, the Lex Julia (90BCE) and the attribution of Roman citizenship to auxiliaries discharged with honour at the end of their 25 year commission. It strikes me that the important fact was that Roman Republic seldomly ever forced its legal system onto the provinces it conquered. Instead, it left them to their designs and focused on taxation and military administration. As I shall mention in the upcoming review of the economy of the Late Roman Empire legal centralization took place slowly from the Nerva-Antonine dynasty onwards, first asserting the primacy of Roman legal procedure, then extending franchise universally with the edict Caracalla in 212 and culminating in the Diocletian and Constantinian reforms of the late third-early fourth centuries, at which point rejection and revolt was unlikely to succeed given the integration or replacement of provicials into Roman society. Thus, unlike Alexander’s politically and philosophically heterogenous Hellenism, Roman hegemony was supported by a well codified and established, albeit fluid, body of law. As noted by Temin (2013:143) and by Tainter (1988) (see here also), the conquests of the city of Rome had a redistributive effect on wealth. Rich generals were able to acquire booty (in the form of land, money/bullion and slaves) with which they were able to accumulate directly or indirectly more land. Rich landowners, more often than not of senatorial or equites rank, grew their properties into latifundi (very large farms) and had their land worked by slaves, which were increasingly available due to military conquest. 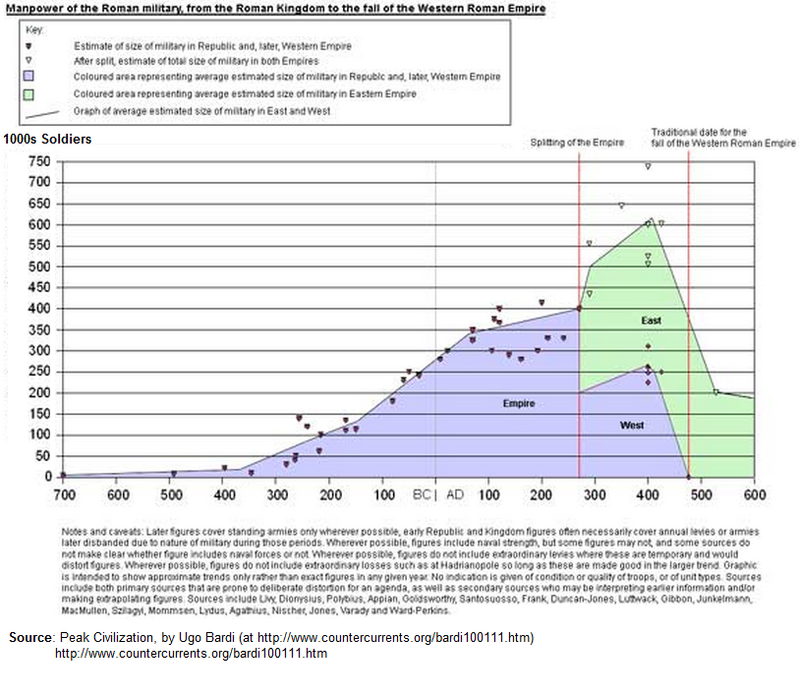 Meanwhile, the ability of small/medium farmers to compete with larger landowners, to fend off buying requests or to demand higher wages was undermined by wars, military service, sabotage, labour competitiveness from the slaves coming out of the newly conquered territories, economies of scale and the increased money supply skewed in favour of generals. This reinforced even further the concentration of property. Either through default or sale, it drove empoverished, unemployed and unlanded masses (the capite censi) towards the city of Rome, where their lack of wealth would have driven them to poverty and away from their military service. Livy describes the interesting story of one such impoverished farmer that is supposed to have triggered the Conflict of the Orders in the 490s BCE. The account is from Book 2, chapter 23 of “Ab urbe condita“ which I first heard about in the fascinating documentary series “Rome: The World’s First Superpower” (Episode 1, minute 31), narrated by Larry Lamb. But not only was war with the Volsci imminent; the citizens were at loggerheads among themselves, and internal dissensions between the Fathers and the plebs had burst into a blaze of hatred, chiefly on account of those who had been bound over to service for their debts. These men complained loudly that while they were abroad fighting for liberty and dominion they had been enslaved and oppressed at home by fellow-citizens, and that the freedom of the plebeians was more secure in war than in peace, amongst enemies than amongst citizens. This bitter feeling, which was growing spontaneously, the notable calamity of one man fanned into a flame. Old, and bearing the marks of all his misfortunes, the man rushed into the Forum. His dress was covered with filth, and the condition of his body was even worse, for he was pale and half dead with emaciation. Besides this, his straggling beard and hair had given a savage look to his countenance. He was recognized nevertheless, despite the hideousness of his appearance, and the word went round that he had commanded companies; yet other military honours were openly ascribed to him by the compassionate bystanders, and the man himself displayed the scars on his breast which bore testimony to his honourable service in various battles. When they asked the reason of his condition and his squalor, he replied, while the crowd gathered about him much as though it were an assembly, that during his service in the Sabine war not only had the enemy’s depredations deprived him of his crops, but his cottage had been burnt, all his belongings plundered, and his flocks driven off. Then the taxes had been levied, in an untoward moment for him, and he had contracted debts. When these had been swelled by usury, they had first stripped him of the farm which had been his father’s and his grandfather’s, then of the remnants of his property, and finally like an infection they had attacked his person, and he had been carried off by his creditor, not to slavery, but to the prison and the torturechamber. He then showed them his back, disfigured with the wales of recent scourging. The sight of these things and the man’s recital produced a mighty uproar. Inevitably the system of checks and balances that had permeated the republican oligarchies was completely undermined. The first civil war of the Roman Republic saw Marius fight Sulla, and set the tone for the brutal proscriptions of the civil wars that were to last for another half century, until the rise of Octavian. Sulla’s constitutional reforms were repealled. Pompey, Crassus and Caesar dominated Rome through the first triumvirate, from whence Caesar emerged victorious, only to be assassinated, followed by the second triumvirate which avenged him and from whence his great nephew emerged as the first emperor of the Roman Empire. The drive of apparently rising income inequality provide guides the continuity of events that led to the fall of the Roman republic as the last step in a progressive reform movement that made the most but also needed to adapt military structures to this new reality. Although the empire in its geographical reach may be traced to the aftermath of the Punic Wars, as a political system it could well have emerged earlier much earlier than 27BCE, when , were it not for the inability or unwillingness of earlier contenders. Marius was unable to hold on to his power ( the brutality of his 7th consulship as described by Plutarch, appears to me to hint at paranoid psychosis), Sulla dominated but deferred to the Senate, both of the Triumvirates were inherently unstable and the dictatorship of Julius Caesar was cut short by overconfidence. Indeed, only Octavian was able to coalesce the right balance of personal ambition, clemency and cunning to rise and remain in power as the holder of all Roman magistratures we have so simply and emblematically come to know as the Emperor. The fact that this was originally a military title should serve as a reminder of the Marian origin of the Roman Empire. 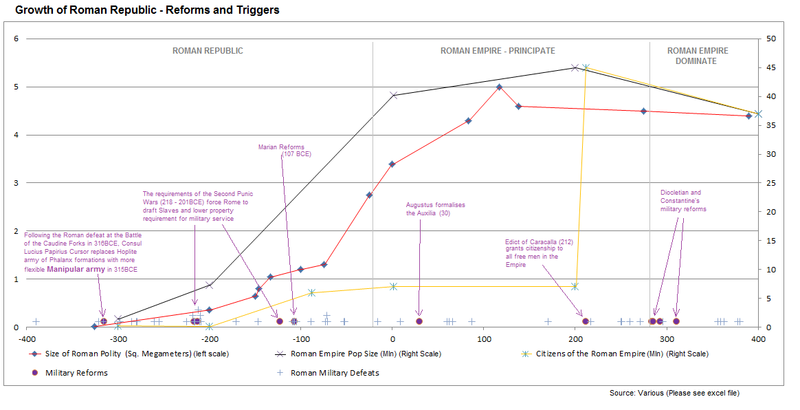 This entry was posted in European History, History, Political Concepts and tagged Ab urbe condita, Capture, Checks and Balances, Citizenry of Roman Republic, Civil Wars of the Roman Republic, Collective action problems, Conflict of the Orders, Emergence of Powers, Europe, First Triumvirate, Gaius Julius Caesar, Gaius Marius, Gracchi, Gracchi brothers, Hegemony, History, History of the West, Hoplites, Income inequality, Institutions, Jugurtha, Julius Caesar, Larry Lamb, Livy, Manipular Army, Manipules, Marcus Aemilius Lepidus, Marcus Crassus, Marian reforms, Mark Anthony, Ocatavian, Optimates, Patricians, Phalanx, Plebeians, Pompeus Maximus, Populares, Punic Wars, Roman Citizenship, Roman Empire, Roman Republic, Roman Republic Army, Roman Republic population, Roman Republic surface, Samnite Wars, Second Triumvirate, Sequencing of conquests, Size of Roman Republic, Size of Roman Republic Army, Size of Roman Republic population, Sulla, Surface of Roman Republic, System Collapse. Bookmark the permalink.